I feel like I’ve been knee deep in black dog hair for the better part of the last four decades, and I’m not talking about those little black haired dust bunnies that whisper along the tile floor in the hallways of the house. I’m talking big, honking piles of hair that I’ve clipped, stripped, scissored and thinned off the bodies of my Gordon Setters to ready them for the ring. I kid you not, there have been times when I have built a whole other Setter out of the hair left on the floor. Good grief these dogs grow coat, acres and acres of it so that sometimes I find myself thinking “I’m gonna to get me one a them big ole John Deere mowers to tackle this petting zoo”. Well obviously most of you own a Gordon Setter so you know what I’m talking about when I say that they take a bit of grooming to keep them looking less like a Newfie and more like a Setter. And, if you’re heading to the show ring you probably know by now that a proper groom makes a world of difference in your chances for success. Groom that dog poorly or trim him the wrong way and you can end up accentuating or creating faults you don’t want seen. Bad idea. It is not easy to learn to properly groom a Gordon for the ring, and I for one, will admit that even after all these years I am always learning. New things come along, methods change, equipment is developed, it’s a never ending learning curve. Sometimes I feel like my grooming skill is no better now than when I was in grade school cutting doll hair with those little rounded kiddie scissors. Did you ever notice that doll hair doesn’t grow back? My sisters did. They weren’t very happy with me. Sibling rivalry I guess? Grooming can be complicated, but it will get a whole lot easier if you start with a clear picture of the dog’s anatomy, the dog breeder’s basic knowledge, and using that mental picture of your breed’s anatomy as your guide when you’re trimming, stripping or thinning your show dog should help you sculpt that dog into a lovely picture of the standard. To give an example, sometimes we might groom what appear to be faults onto the dog by leaving a vertical line of stripped hair going straight down the dog’s side from the bottom of neck to the foreleg. In fact we want to show angles there, the angle where the shoulder and upper arm meet, so there should be a sideways V shape to that line. Leave a straight line down the side of the dog when you’re stripping out coat and the judge will see a straight front, one that lacks proper angle of shoulder to upper arm. It’s an optical illusion that can hurt your chances of winning. Or, ignore trimming the under body coat to into soft flowing lines, leaving instead shorter or longer coat in the wrong area and you destroy the flow of the Setter’s natural body contour, he looks unbalanced and a maybe a bit box or tube shaped, not the picture we’re looking for. I found a grooming blog, Beyond the Fur… written by Melissa Verplank who published an excellent article The Importance of Canine Anatomy and it teaches about using the structure of the dog to set a pattern when grooming. 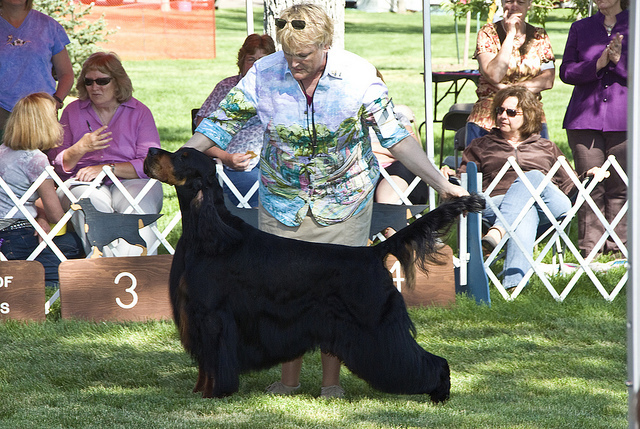 This is right on the money and I highly recommend, especially if you are a new learner, that before you begin grooming your Gordon Setter, particularly for the show ring, that you take the time to read this article and review her diagrams. You absolutely must have an ideal picture of the structure of a Gordon Setter in your mind in order to properly scissor and strip and shape that body coat. And you must keep that picture in mind so that when you step back away from the dog to view your work, you are seeing all of the excellent qualities you want a judge to notice about your dog. 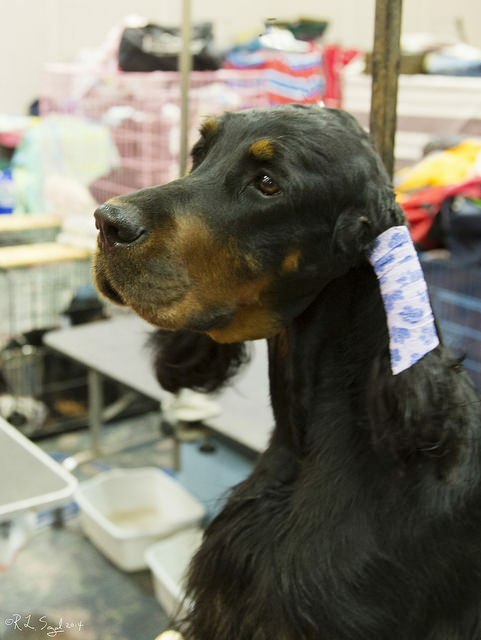 Earlier articles that were published here on Gordon Setter Expert about grooming can be found here for those looking to get started grooming their own dog. Hope you enjoy these articles. 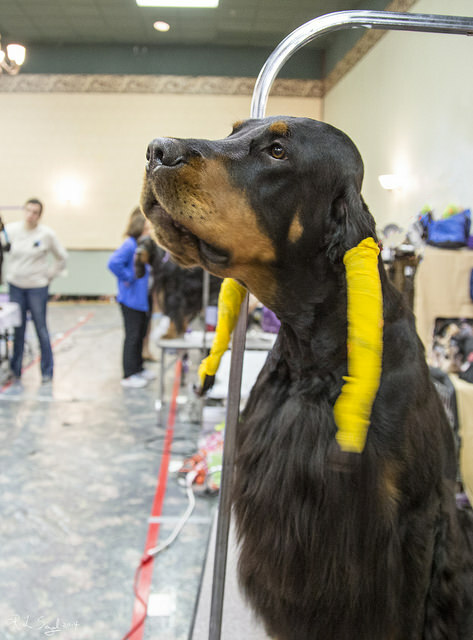 We’re gearing up to come back from the GSCA National with some great “how to” videos of exhibitors grooming their dogs, we’re sure that we’ll find some great Gordon Setter folks who will share their tips and tricks with you. Judy Hill – excellent site and the cat foot video was very helpful, fine tuning previous instruction I’ve received. So good to hear you found this useful Judy! I’m so glad to be helpful! Celeste Clark – I found every dog needed to be groomed differently depending on their conformation. I had hair in Irish setters. You could hide a fault if you groomed properly. Some people groom each dog the same way. Big mistake. Oh, sorry Sally I misunderstood, I thought you meant when you were in a hurry you used shortcuts, didn’t realize this actually happened to you! That bites! Isn’t that the truth Karen! I learned to groom Setters back in the 70’s and there sure wasn’t much of anything written about grooming. Some of the stuff I found back then even said to use clippers to clip the back coat OMG what bad, bad advice!! I read your first paragraph and just about died laughing. I have a gordon setter, she is a pet not a show dog but we live in south florida so i just keep her clipped short all of the time because it’s hot and she jumps in an out of the pool all day long. I can really identify with all the hair.